On June 10, 2017, about 1430 Pacific daylight time, a Piper PA28-161 airplane, N2171D, was substantially damaged following impact with terrain while maneuvering in instrument meteorological conditions about 4 nautical miles (nm) northeast of Carpinteria, California. The non-instrument rated private pilot was seriously injured. The airplane was owned and operated by National Air College International Inc., San Diego, California. The personal cross-country flight was being operated in accordance with Title 14 Code of Federal Regulations Part 91, and no flight plan had been filed. The pilot departed Montgomery-Gibbs Executive Airport (MFY), San Diego, California, about 1100, and was destined for Santa Ynez Airport (IZA), Santa Ynez, California. In a report submitted to the National Transportation Safety Board investigator-in-charge, the pilot reported that the coastline was covered in overcast clouds, and over Santa Barbara (SBA), California, about 19 nm west-northwest of the accident site, the clouds were at 2,200 ft above ground level (agl). The pilot stated that due to the clouds, he began to descend to get the ground in sight, but at 2,100 ft agl he was still in a thick cloud and could not see outside. 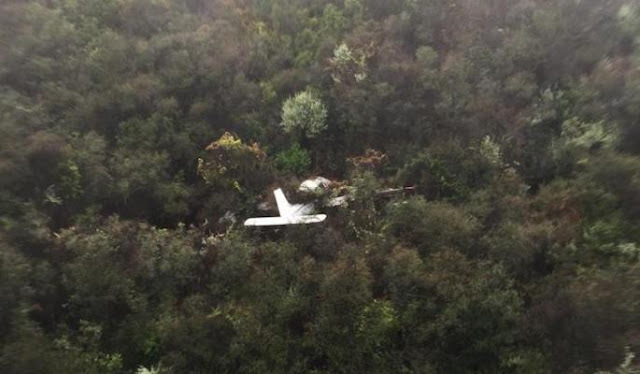 The pilot reported that after he failed to make a decision to climb or contact air traffic control for assistance, he crashed into a mountain ridge. The airplane came to rest upright on a westerly heading with its left wing bent back at mid-span. The pilot was able to contact emergency responders by cell phone. Search and rescue personnel located the downed airplane and rescued the pilot by helicopter about 1700. A strong presence of fuel was detected at the accident site. The pilot reported no mechanical anomalies with the airplane or engine prior to or during the flight that would have precluded normal operations. The weather reporting facility at SBA, located about 19 nm west of the accident site, revealed a ceiling of 2,800 ft agl about 35 minutes prior to the accident, and a ceiling of 2,600 ft agl about 20 minutes following the accident. Winds were reported out of the south and southwest from 6 to 7 knots. On June 10, 2017, about 1430 Pacific daylight time, a Piper PA28, N2171D, was substantially damaged following impact with terrain while maneuvering about 4 nautical miles (nm) northeast of Carpinteria, California. The private pilot, the sole occupant, was seriously injured. The airplane was owned and operated by National Air College International Inc., San Diego, California. The personal cross-country flight was operating under the provisions of 14 Code of Federal Regulations Part 91, and no flight plan had been filed. The pilot departed Montgomery-Gibbs Executive Airport (MFY), San Diego, California, about 1100, with the destination reported as the Santa Ynez Airport (IZA), Santa Ynez, California. In a report submitted to the National Transportation Safety Board investigator-in-charge, the pilot reported that the coastline was covered in overcast clouds, and over Santa Barbara (SBA), about 19 nm west-northwest of the accident site, the clouds were at 2,200 ft above ground level (agl). The pilot stated that due to the clouds, he began to descend to get the ground in sight, but at 2,100 ft agl he was still in a thick cloud and could not see outside. The pilot concluded by saying that after he failed to make a decision to climb or contact air traffic control for assistance, he crashed into a mountain ridge. The airplane came to rest upright on a westerly heading with its left wing bent back at mid-span. The pilot was able to contact emergency responders by cell phone. 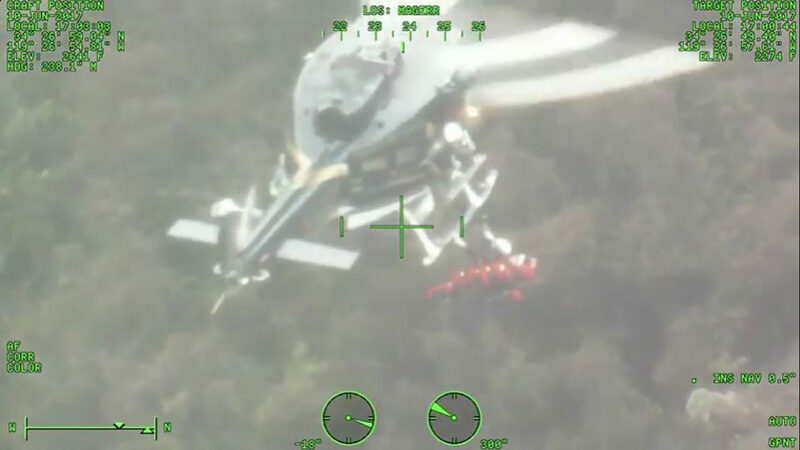 Search and rescue personnel located the downed airplane and rescued the pilot by helicopter about 1700. A strong presence of fuel was detected at the accident site. The pilot reported no mechanical anomalies with the airplane prior to or during the flight that would have precluded normal operations. The weather reporting facility at SBA revealed a ceiling of 2,800 ft agl about 35 minutes prior to the accident, and a ceiling of 2,700 feet agl about 20 minutes following the accident. Winds were reported out of the south and southwest at about 7 knots.